At 35, he's one of Bollywood's best known hairstylists. 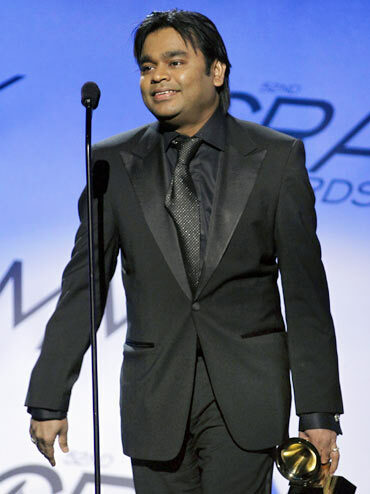 Among other things, Ryan D'Rozario was responsible for A R Rahman's straight hair at the Grammy Awards. Which is why it comes as a shock when you learn Ryan was a resident DJ and graphic designer at Spin Visuals before he switched to hair styling. After a year long course with famed Mumbai stylists Nalini & Yasmin, he worked with them for nine years. Then, he launched his own brand -- Salon Muah. One of his clients -- casting director Shanu Sharma -- got him his first Bollywood break. Ryan was chosen by the Yash Raj banner to style Saif Ali Khan and Rani Mukherji for Hum Tum. His graphic designing background came handy when he showed his stars how their hair would look in the film. Ryan's celebrity clientele has only grown since 2004. He shares their starry secrets with rediff.com's Patcy N.
My first Bollywood star client was Saif Ali Khan. After I clicked his pictures, I used them to create the seven different hairstyles Hum Tum demanded. Saif was very finicky about his hair. It was a little difficult at the start but, luckily, Yash Raj had interviewed me and I had met Saif several times before the shooting actually started. Saif has a combination of wavy and straight hair; it has great texture. We coloured his hair to beach blonde for Hum Tum. It was my favourite hairstyle on him and it appears towards the end of the film. In this style, his hair in front is a little straighter. It's a Chinese kind of look which he has maintained till date. 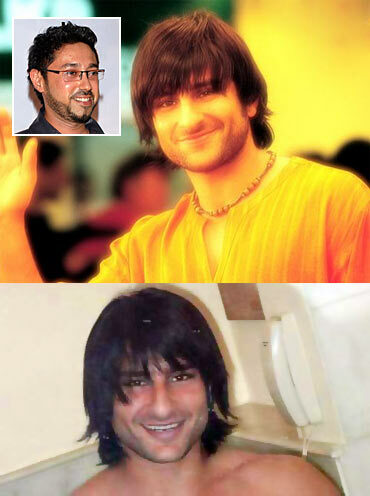 In one section of the film, Saif had to have long hair. We used a wig and cut the hair on the wig itself. Everybody, from the director to Saif, loved it; they felt it resembled Tom Cruise's look from Mission Impossible. They even use the the dialogue, 'Yeh mera Tom Cruise look hai,' in the film. After everyone left, though, Saif felt the hair was coming on his face. He asked me to redo it. I was not happy because the director had okayed the look; but he insisted and forced me to cut it. Saif is a great person to work with; he's a real prankster. For Hum Tum, we shot in Amsterdam for a month and had so much fun. Photographer Joy Dutta. Saif and I would occasionally go out partying. On the sets, we would keep our distance but otherwise Saif is very friendly person. It is just that you should know your work and know where to draw the line. I was also called for Saif's next Yash Raj movie, Salaam Namaste. I gave my ideas for Saif's and Arshad Warsi's looks in the film on a CD as they had demanded. I even cut Saif's hair. Later, though, I came to know I was not going to do the film since its budget has been slashed. When the movie released, however, I realised they had used all my ideas. I was very upset because they did not pay me or give me credit. They apologised later, but I felt bad. People had warned me about Aamir and how he wanted everything perfect. I met him a couple of times before we started shooting for Fanaa and discussed I wanted to do with him and what he wanted from me. Aamir was not comfortable working with a new hair stylist; he was used to Avan Contractor. But, after a few meetings, things worked out really well. What is superb about Aamir is that, once the look is set and just before the shoot starts, he calls the hair stylist and make up artiste home. He will time you to find out how long you take to do his hair and make-up. He will then tell the production people the exact time he will be ready on the sets. This makes it easier and faster for everyone because we are ready with everything we need and the work finishes on time. 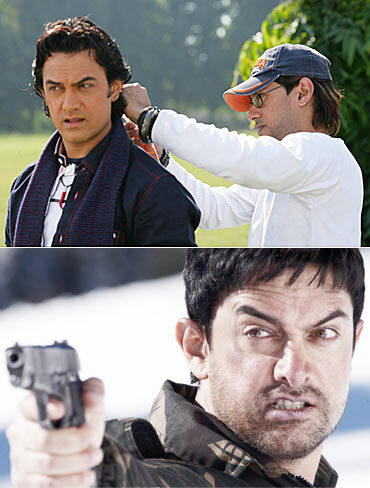 In Fanaa, Aamir had two looks. In one, he had to look like a street-smart Kashmiri boy so we decided on longer hair. Also, Fanaa was right after Rang De Basanti where he had slightly long hair. We just added extensions and fillers to create the volume and length required. As a result, when we showed the second character with short hair, it gave a very distinct, separate look. Aamir has dark brown, curly hair -- you must have seen it in Mangal Pandey where he had grown his hair really long -- that's easy to play around with. He is very professional and has a dry sense of humour. Of course, he solved it within one minute and Kajol and Mallika had to bow to him. When we were shooting in Poland, there was snow everywhere. Aamir would bang into people so hard that they would slip and fall into the snow. No one realised he was doing it deliberately. One day, he pushed Kajol and she decided to get back at him. She hid behind his make-up van, waiting to push Aamir. It so happened that I saw her and warned Aamir. He told me to get down from the van first and asked me to jump out instead of walking. Kajol thought it was Aamir and came to push me, but she missed because I had jumped out of the van. Aamir came after me and pushed Kajol into the snow. Though I was supposed to do only Aamir for Fanaa, I also styled for Kajol because they were having some problems with her hair extensions. She loved what I did with her hair and has been my regular client since then. Now, I am working with her on the remake of Step Mom and on her home production Toonpur Ka Hero. Kajol's hair is wavy and, when she crunches it, it looks beautiful. She likes to maintain her hair's natural look. She takes very good care of her hair and keeps it hydrated, which is why its texture is really nice. She is not really into colouring her hair, but I did colour it slightly red for U Me Aur Hum. She was sceptical but agreed because I had coloured her sister Tanisha's hair and given her various looks. We went extreme with colours on Tanisha's hair but we've brought it back to normal now. Kajol only talks to people who she is comfortable with. In the beginning, people warned me Kajol is very difficult but I did not have any problems with her. 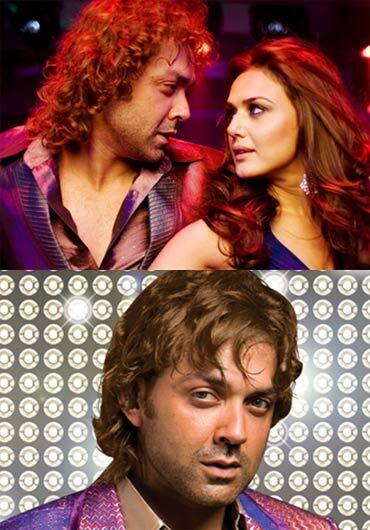 It was quite difficult styling Bobby's look in Jhoom Barabar Jhoom. Bobby had long hair in the film but, in a couple of scenes, they wanted him to sport short, black hair. The day after that, they demanded long, coloured blonde hair, so that was tough. So we kept his hair long. When he needed to have shorter hair, we pinned it up and set it so that he looked as if he had short hair. And we'd wash away the colours. Bobby is a darling. He is easy to work with and gives you creative freedom. If things get delayed, he does not throw a tantrum. He will chill and do his own stuff. I was signed to do Abhishek and Bobby for Jhoom Barabar Jhoom, but Abhishek does not like anything to be done to his hair so he was not keen on a stylist. After he saw the way I was working with Bobby though, he would ask me to do his hair once in a while. 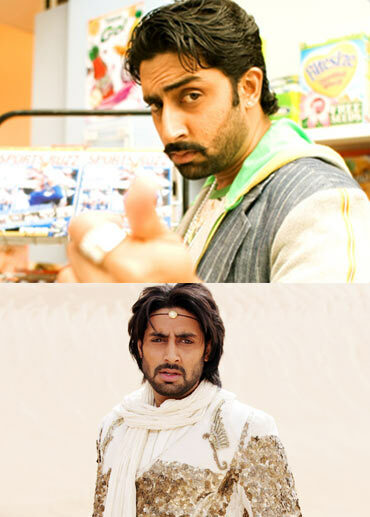 Abhishek had a long hair in Jhoom... but he had a one day shoot for Guru where he wanted short hair. Since he had seen what I had done with Bobby's hair, he asked me how it could be done. I did not go to Chennai, but explained the method to his stylist there. After that, Abhishek allowed me to do anything with his hair. I even relaxed it in Jhoom... Abhishek mostly works with his friends and takes things in a lighter vein which could be why I had problems with him initially. Later, though, I was very comfortable. I worked with Abhishek on Drona as well. We had blast during the shoot because it went on for a year. When we were in Rajasthan, it rained so heavily that it flooded the place; it was apparently the heaviest rain the people there had seen in 20 years. We had to get dry sand the next day in order to maintain continuity. Even Abhishek helped to dig the dry sand from below. Kay Kay is a star in his own right. He has been my client since Drona. When I worked with him in Main, Meri Patni Aur Woh, he would not allow me to do anything with his hair. He asked me to use water to set his it because he did not want any products used, so I didn't do anything. In Drona, though, he didn't have a choice because they wanted a joker-like look with a mean streak. It was a very difficult look. It would take at least half an hour every day to make his hair stand like that. We also needed to use strong gels as the scenes required a lot of breeze; they had a lot of fans on the set to create a windy effect. His hair had to stay set in all conditions; getting that done was tedious. I am now working with Kay Kay on another movie. I did Deepika's hair in Chandni Chowk To China. She had two looks in the film and I did both. For one look, I was told she is a Chinese girl who knows martial arts and they wanted her to have long hair. So we used a really long wig. We also cut bangs from her natural hair and merged both in such a way that she looked good even when she was not wearing her wig. Her bangs were the talk of the town. For the other look, we went with her natural, wavy hair. When I first met Deepika, she was looked fabulous in a black cat suit. Though she was surrounded by people discussing her look, she carried herself well and talked to them in a calm and composed manner. I was doing Saif's hair for the Airtel ad, when his clothes stylist, Vijeyta, who is my client, introduced me to A R.
I cut his hair and he liked it. Since then, whenever he needs a haircut, I fly down to Chennai. Else, I travel to wherever he has his show. I travel to Chennai every two months. If there is a show, I have to go more often. I don't cut his hair at night as he works then. I meet him for lunch, cut his hair and fly back. The last cut I gave him was for the Grammy's where I straightened his hair. AR's hair is very curly and tends to look fizzy, giving him an untidy look. So we started keeping it short. But, of late, he has started looking more chubby. We tried keeping his hair longer as a contrast, but it started coming all over his face. We decided to relax his hair. A R wanted to straighten it, but I convinced him to first go for relaxation as it would look natural. Straightening without relaxing would make his hair look poker straight. By the time I went to see him again, he had fallen in love with this look and wanted straightened hair. I did it in time for the Grammy's. A R is very shy person. I have been working with him for a year now. I talk to him about everything, including his music, since I used to be a DJ. Grooming SRK for the perfect shot!